Lake Natron is spectacularly rich in biodiversity, natural beauty and environmental value and these characteristics give it not only great tourism potential but also make the lake extremely important for conservation. 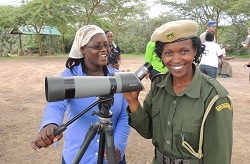 Eco-tourism at Lake Natron could help conserve an extremely important natural resource, while at the same time helping local communities develop sustainable livelihoods. Lake Natron is the only significant and regular breeding site for the East-African population of Lesser Flamingo (Phoeniconaias minor) which is categorized as Near Threatened by the International Union for the Conservation of Nature (IUCN) Red list of Threatened Species, mainly because of interest in soda ash mining at Lake Natron. Over 75 per cent of the world population of this species migrates each year to Lake Natron to breed, and the survival of the Lesser Flamingo will depend on the lake’s conservation. 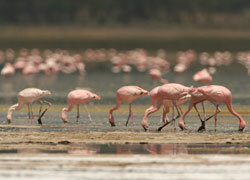 Experts say that without Lake Natron as a habitat to breed, the iconic Lesser Flamingo would no doubt be en route to extinction. Lake Natron is a salt lake located on the border between Tanzania and Kenya, part of the eastern branch of the Rift Valley. Lake Natron is an ideal candidate to be part of the Destination Flyways project because of its exceptional ecological significance for migratory birds and many other species, as well as its great potential to be developed as a popular bird related tourist location. The lake's unique ecology as a soda lake, its pristine natural state and its importance to many species of migratory birds makes it an exceptionally important environmental habitat with many functions in the natural ecosystems. Conservation biologists have been interested for decades in ensuring the conservation of Lake Natron. However, mining companies are also interested because of its abundance of Soda Ash, a substance used in many industrial processes and products. Since 2006, the Government of Tanzania has maintained a keen interest in mining soda ash at Lake Natron. However, local and global environmental organizations such as BirdLife International have serious concerns about impacts on both the environmental local communities. Recent surveys also show that local residents also oppose the proposed mine. An August 2012 survey showed that 75 per cent of local residents were opposed to the construction of the plant. Scientists also have serious doubts about the value of the mining project, and want to develop the lake as an eco-tourist location instead. A recent economic study showed soda ash mining would lead to economic losses of up to $492 million in 50 years while tourism and livelihoods support would provide benefits of up to $1.57 billion. The study showed that investment in tourism, community livelihoods and environmental conservation was a better economic option. By pursuing this option, Tanzania would stand to gain up to $ 1.57 billion in the next 50 years. After Tanzania joined the Ramsar Convention on Wetlands in 2000, Tanzania’s Lake Natron Basin was added to the Ramsar Convension on Wetlands List in 2001. Lake Natron was designated as a Wetland of International Importance according to Article 2 of the Ramsar Convention. 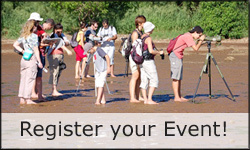 The main objective of designating these sites is to “develop and maintain an international network of wetlands which are important for the conservation of global biological diversity and for sustaining human life through the maintenance of their ecosystem components, processes and benefits/services”. The Convention on Wetlands (Ramsar, Iran, 1971) -- called the "Ramsar Convention" -- is an intergovernmental treaty which commits its member countries to maintain the ecological character of their Wetlands of International Importance and to plan for the "wise use", or sustainable use, of all of the wetlands in their territories.